Join all the big cats for the best race in town! The Cheetah Chase 5K starts at the Little Rock Zoo and takes runners through the Hillcrest neighborhood and ends back at the front entrance of the Zoo. The 1K Family Fun Run starts and ends inside the Zoo. All participants gets FREE Zoo admission all day on the day of the race, a free Penguin Pointe bag, and get a free race t-shirt. Participants are also encouraged to wear fun, family-friendly attire that is animal themed. Prizes will be given for best “big cat” costume and best animal costume. 5K & 1K Registration: $35 per person/$65 per family of four (includes up to two adults and two children under the age of 12 or one adult and three children under the age of 12). Children under the age of one in strollers are admitted free. Late registration will begin at 10 am on Friday, May 31, 2013 and continue through race day. Please see section below for specific locations and times. Race Day Schedule: 7:00 a.m. Packet Pick-Up and Late Registration Begin; 8:30 am Official 5K/1K Start; 9:00 am Awards given to the top 10 male and female finishers as they finish. 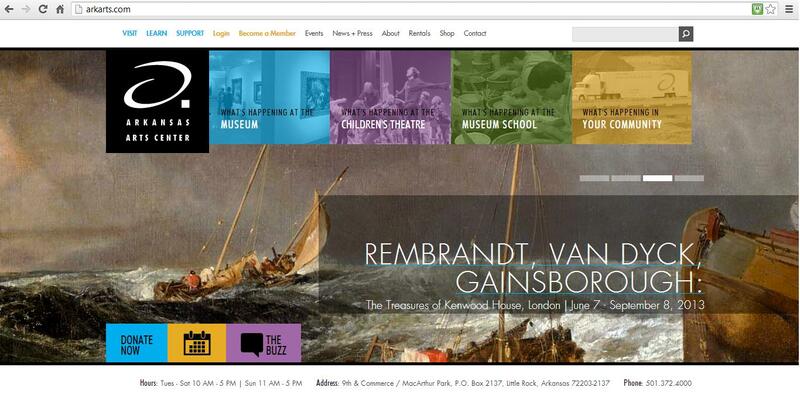 Earlier this month, the Arkansas Arts Center launched a new website. The new website features easier ways to learn about exhibits and upcoming events, join the Arkansas Arts Center or purchase tickets. In 1955 the National Old Line Insurance Building was opened. This seven story structure has been described as “perhaps the finest example of the International Style of architecture in Arkansas.” Over the years, the building has switched ownership and changed names several times. Over the years the building has generated controversy. Because of its height (7 stories) and architectural style, it has often been derided as detracting from the look of the adjacent Arkansas State Capitol Building. There have been several suggestions that the building be torn down and replaced by a parking lot or a lower and more architecturally-sympathetic building. Conversely, there have also been attempts to expand the building. Neither school of thought has succeeded. Today the building is known as the 501 Building (an homage to its address on Woodlane as well perhaps as a nod to the area code of Central Arkansas). It houses many state offices. The Little Rock Convention & Visitors Bureau has announced the 2013 Movies in the Park season. Things kicks off on June 12 with Twilight Breaking Dawn (PG 13). The films take place at First Security Amphitheatre in Riverfront Park along the banks of the Arkansas River near La Petite Roche, Little Rock’s namesake. Families, picnics and pets are invited to the park to enjoy movies under the stars. The amphitheater will open an hour before film showings and movies will start at sundown each week. For more information please visit http://moviesintheparklr.net/. This month’s Science After Dark is on May 29 and will be “Can You Tinker Your Way Out of a Paper Bag: Tinkerfest Preview”. Some of the upcoming Tinkerfest activities will be available before the June 15 event. 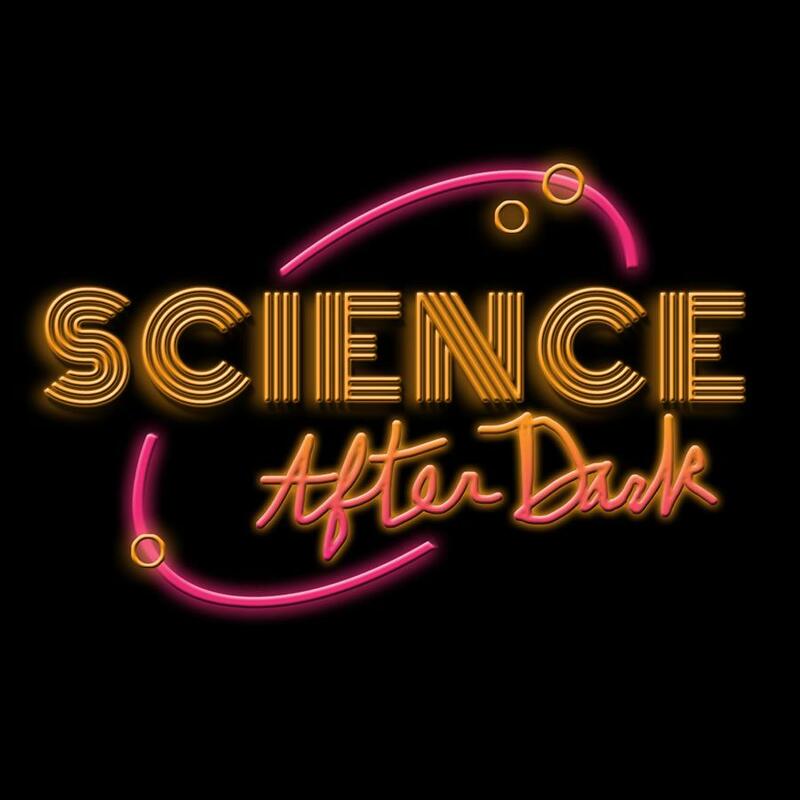 Science after Dark occurs the last Wednesday of each month from 6pm to 8pm. Museum educators pick a science-related topic, and develop an event around it. The event is for ages 21 and older. General admission is $5 per person. Museum members get in free. It is a great chance to explore the museum’s exhibits and enjoy downtown Little Rock. The Arkansas Arts Center just opened an exhibit on Bauhaus architecture. Though Little Rock doesn’t have any strictly Bauhaus style buildings, there are a few buildings designed in the International Style which was related to Bauhaus. The Arkansas Power & Light Building on Louisiana and 9th Streets was announced in 1953 and completed in 1959. The design was by Fred Arnold of the Wittenberg Delony & Davidson firm. The reason for the delay was due to uncertainty regarding a rate case and labor contracts. 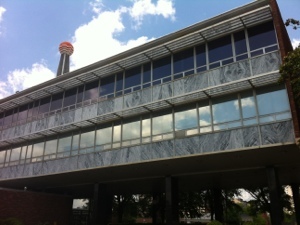 The four story building features a combination of glass, marble and brick. The second and third stories float over an open space as they extend eastward. 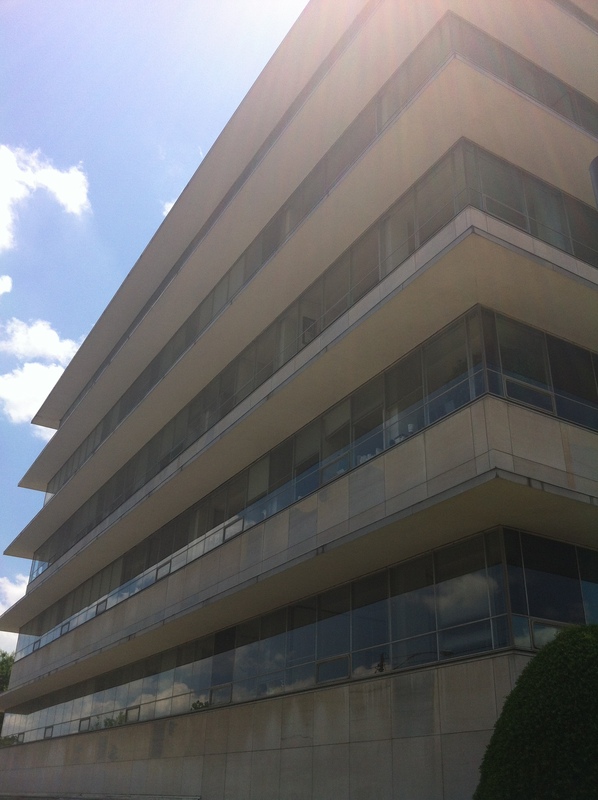 In 2010, the marble panels on the second and third stories were replaced because of buckling. They were replaced with marble from the same quarry as the original marble. The orb atop the building once bore the likeness of Reddy Kilowatt, a mascot used by AP&L as well as many other electric utilities in the post-World War II era. When AP&L changed its name to Entergy Arkansas (as part of the system-wide rebranding of various companies into Entergy), the orb was replaced with one which features a three-dimensional version of the Entergy logo. Organized by Foto+Synthesis Incorporated, Bauhaus twenty-21: An Ongoing Legacy – Photographs by Gordon Watkinson runs through September 22. This exhibition conveys the architectural history, design and enduring philosophies of the Bauhaus, a German expression meaning “house for building” and the name of an important German School principle of architecture and design. The exhibition offers a unique perspective on Bauhaus design philosophy as it relates to architecture and its relevance in today’s society. 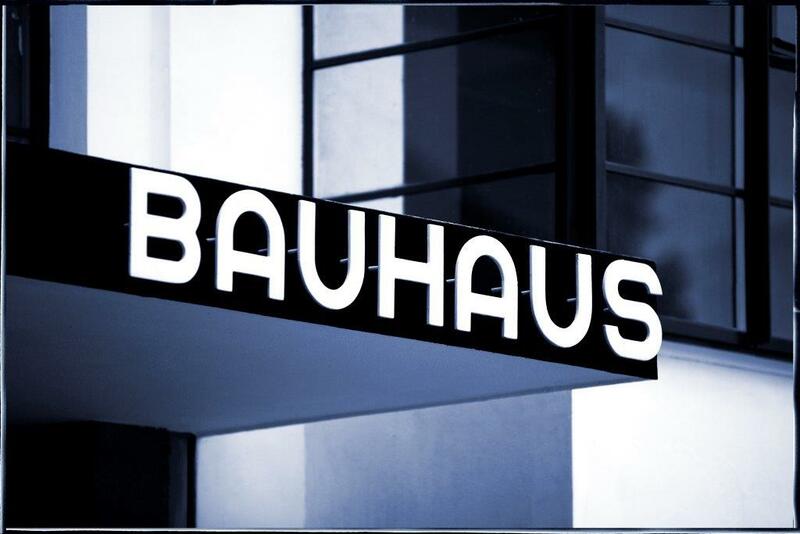 The Bauhaus school was founded by Walter Gropius in 1919 and introduced principles that shaped the foundation of modern architecture. Conceived as a project encompassing architecture, design and photography, Bauhaus twenty-21 not only conveys the architectural history, but also illustrates the enduring philosophies of the Bauhaus. The exhibition is comprised of 77 photographs, plans and elevations and furniture that capture the essence of Bauhaus design and its influence on modern architecture and design.